Greg Ray is a dog lover – as if that was not already obvious. He is the proud owner of a ‘bitser’ called Bremer who is a cross between a Border Collie and a Boxer. Bremer wandered into the Ray household as a stray; gulped down her first meal for days; scratched up the fireplace rug and settled in for life. She has been successfully running the family ever since. Greg is a wordsmith, having worked as a journalist and a communication specialist. He has also written several books of fiction, which will also be progressively released in the future. He and his wife Jacinta live in Tasmania’s historic Battery Point. Jenny Miller, who provides the beautiful illustrations for the Why Dogs series of books, is the proud owner of a rescue dog called Sasol who bears a remarkable resemblance to Rastus Ramier, the pup who features in the first book of the series Why Dogs Circle to Lie Down. Rastus also features in the Christmas book Why Dogs Don’t Bark at Santa.Jenny happily admits Sasol was an obvious model for her early drawings. 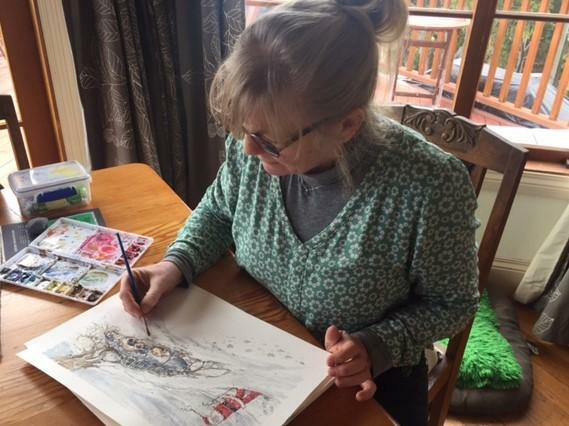 Jenny grew up in a household where painting was a celebrated skill.However, it wasn’t until recently that she has been in a position to focus on her passion for drawing and painting. 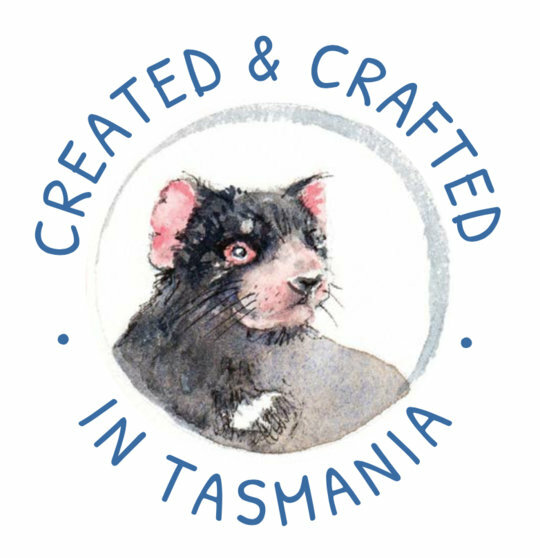 She and her husband enjoy life in the delightful Tasmanian bayside town of Kingston, south of Hobart. Sasol likes it too! While Greg (Author) and Jenny (Illustrator) concentrate on producing even more wonderful books for children, Jacinta takes care of business. Greg describes her as the Director of Just About Everything. Jacinta has a wealth of experience in retail and customer service, having run her own retail chain and worked as a media and communication sales and marketing consultant. 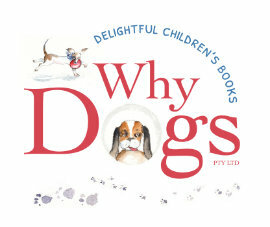 She is also a mother and a dog lover who delights in sharing the joy of the Why Dogs books with children. 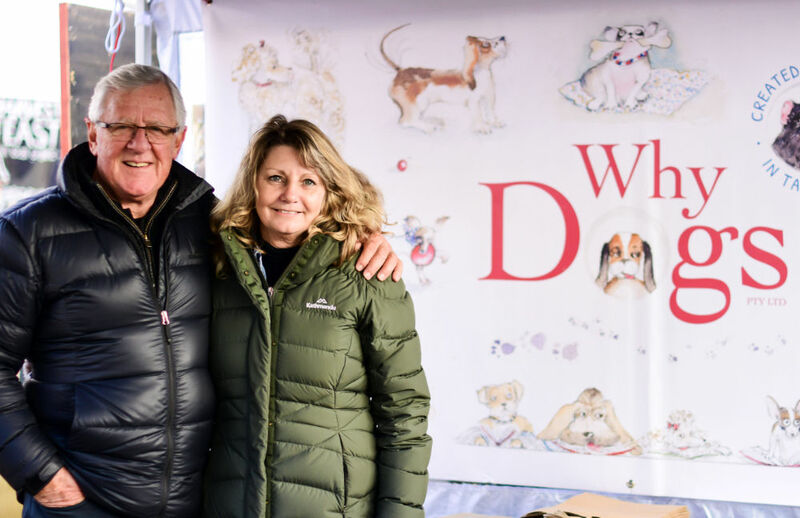 Holly Webber is the graphic design specialist who provides the creative bond that ties together the individual skills of Greg and Jenny into the beautiful books that comprise the Why Dogs series. Holly, who runs her own creative design studio, lives a slightly nomadic life, spending the early part of each winter working in England. Most of the year, however, she lives in Hobart’s historic Battery Point. She’s the tall, slim, dark haired young woman you might have seen pounding the pavements of the city’s historic waterfront early in the morning.